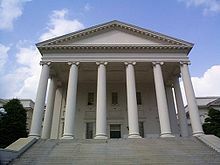 The Virginia General Assembly is the legislative body of the Commonwealth of Virginia, and the oldest continuous law-making body in the New World, established on July 30, 1619. The General Assembly is a bicameral body consisting of a lower house, the Virginia House of Delegates, with 100 members, and an upper house, the Senate of Virginia, with 40 members. Combined together, the General Assembly consists of 140 elected representatives from an equal number of constituent districts across the commonwealth. The House of Delegates is presided over by the Speaker of the House, while the Senate is presided over by the Lieutenant Governor of Virginia. The House and Senate each elect a clerk and sergeant-at-arms. The Senate of Virginia's clerk is known as the "Clerk of the Senate" (instead of as the "Secretary of the Senate", the title used by the U.S. Senate). The Republican Party currently holds a one-seat majority in the Senate and a two-seat majority in the House following gains by Democrats in the 2017 House election. The General Assembly meets in Virginia's capital of Richmond. When sitting in Richmond, the General Assembly holds sessions in the Virginia State Capitol, designed by Thomas Jefferson in 1788 and expanded in 1904. During the American Civil War, the building was used as the capitol of the Confederate States of America, housing the Congress of the Confederate States. The building was renovated between 2005 and 2006. Senators and Delegates have their offices in the General Assembly Building across the street directly north of the Capitol. The Governor of Virginia lives across the street directly east of the Capitol in the Virginia Executive Mansion. The Virginia General Assembly is described as "the oldest continuous law-making body in the New World". Its existence dates to its establishment at Jamestown on July 30, 1619 by instructions from the Virginia Company of London to the new Governor Sir George Yeardley. It was initially a unicameral body composed of the Company-appointed Governor and Council of State, plus 22 burgesses elected by the settlements and Jamestown. The Assembly became bicameral in 1642 upon the formation of the House of Burgesses. At various times it may have been referred to as the Grand Assembly of Virginia. The General Assembly met in Jamestown from 1619 until 1699, when it first moved to the College of William & Mary near Williamsburg, Virginia and later met in the colonial Capitol building. It became the General Assembly in 1776 with the ratification of the Virginia Constitution. The government was moved to Richmond in 1780 during the administration of Governor Thomas Jefferson. The annual salary for senators is $18,000. The annual salary for delegates is $17,640. Under the Constitution of Virginia, Senators and Delegates must be 21 years of age at the time of the election, residents of the district they represent, and qualified to vote for members of the General Assembly. Under the Constitution, "a senator or delegate who moves his residence from the district for which he is elected shall thereby vacate his office". The state constitution specifies that the General Assembly shall meet annually, and its regular session is a maximum of 60 days long in even-numbered years and 30 days long in odd-numbered years, unless extended by a two-thirds vote of both houses. The governor of Virginia may convene a special session of the General Assembly "when, in his opinion, the interest of the Commonwealth may require" and must convene a special session "upon the application of two-thirds of the members elected to each house". Article II, section 6 on apportionment states, "Members of the ... Senate and of the House of Delegates of the General Assembly shall be elected from electoral districts established by the General Assembly. Every electoral district shall be composed of contiguous and compact territory and shall be so constituted as to give, as nearly as is practicable, representation in proportion to the population of the district." The Redistricting Coalition of Virginia proposes either an independent commission or a bipartisan commission that is not polarized. Member organizations include the League of Women Voters of Virginia, AARP of Virginia, OneVirginia2021, the Virginia Chamber of Commerce and Virginia Organizing. Governor Bob McDonnell's Independent Bipartisan Advisory Commission on Redistricting for the Commonwealth of Virginia made its report on April 1, 2011. It made two recommendations for each state legislative house that showed maps of districts more compact and contiguous than those adopted by the General Assembly. In 2011, the Virginia College and University Redistricting Competition was organized by Professors Michael McDonald of George Mason University and Quentin Kidd of Christopher Newport University. About 150 students on sixteen teams from thirteen schools submitted plans for legislative and U.S. Congressional Districts. They created districts more compact than the General Assembly's efforts. The "Division 1" maps conformed with the Governor's Executive Order, and did not address electoral competition or representational fairness. In addition to the criteria of contiguity, equipopulation, the federal Voting Rights Act and communities of interest in the existing city and county boundaries, "Division 2" maps in the competition did incorporate considerations of electoral competition and representational fairness. Judges for the cash award prizes were Thomas Mann of the Brookings Institution and Norman Ornstein of the American Enterprise Institute. In January 2015, Republican State Senator Jill Holtzman Vogel of Winchester and Democratic State Senator Louise Lucas of Portsmouth sponsored a Senate Joint Resolution to establish additional criteria for the Virginia Redistricting Commission of four identified members of political parties, and three other independent public officials. The criteria began with respecting existing political boundaries, such as cities and towns, counties and magisterial districts, election districts and voting precincts. Districts are to be established on the basis of population, in conformance with federal and state laws and court cases, including those addressing racial fairness. The territory is to be contiguous and compact, without oddly shaped boundaries. The commission is prohibited from using political data or election results to favor either political party or incumbent. It passed with a two-thirds majority of 27 to 12 in the Senate, and was then referred to committee in the House of Delegates. In 2015, at Vesilind v. Virginia State Board of Elections in a Virginia state court, plaintiffs sought to overturn the General Assembly's redistricting in five House of Delegate and six state Senate districts as violations of both the Virginia and U.S. Constitutions because they failed to represent populations in "continuous and compact territory". ^ "About the General Assembly". Virginia's Legislature. State of Virginia. Retrieved 5 June 2013. ^ Billings, Warren M.: A Little Parliament; The Virginia General Assembly in the Seventeenth Century (Richmond, The Library of Virginia, in partnership with Jamestown 2007/Jamestown Yorktown Foundation. 2004);. ^ Annual Reports of Officers, Boards and Institutions of the Commonwealth of Virginia, Report of the State Librarian, Volume II. p. 543. ^ "General Information: Senate Archived 2012-07-23 at WebCite." ^ "General Information: House of Delegates Archived 2012-07-23 at WebCite." 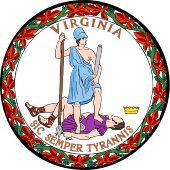 ^ Constitution of Virginia, Art. IV, § 4. ^ Art. IV, Sect. 6 Constitution of Va.
^ Constitution of Virginia, Art. IV, § 6. ^ "the virginia redistricting coalition - Coalition Members". Archived from the original on October 10, 2014. ^ The Public Interest in Redistricting Bob Holsworth, Chair for the Independent Bipartisan Advisory Commission on Redistricting, Commonwealth of Virginia, April 1, 2011, p.22-27.